Parker, Edward Earl, 85, of Louisville died Sunday December 16, 2018 at his home. 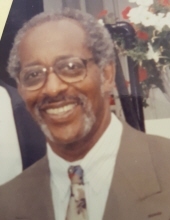 He was a native of Meridian, MS a retired barber, a Korean War Army Veteran, a member of St. Augustine Catholic Church, The Knights of St. Peter Claver and a former member of the Yearlings Club. He is survived by his wife Shirley A. Parker; a daughter Michelle L. Ardis; three sons Andre F. Perry; Greco L. Perry (Angela) and Tyrone D. Perry (Gretta); a sister Cordell Edmonds (Felix); 22 grandchildren and 10 great grandchildren. His funeral service will be held 1:00 p.m. Friday December 21, 2018 at St Augustine Catholic Church 1310 W. Broadway. Visitation will be 11:00 a.m. to 1:00 p.m. Friday at the church. He will be buried at Kentucky Veterans Cemetery Central. To send flowers or a remembrance gift to the family of Edward Earl Parker, please visit our Tribute Store. "Email Address" would like to share the life celebration of Edward Earl Parker. Click on the "link" to go to share a favorite memory or leave a condolence message for the family.